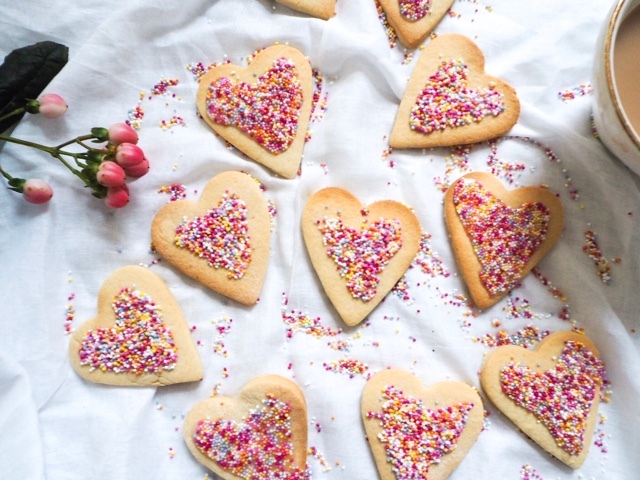 Wither you are making a sweet treat for or with your loved ones, this vanilla sprinkle cookies will take you know time at all to make, so that you can spend quality time with the one you love. If you are travelling on a romantic getaway, or spending a cosy night home, these cookies will add an extra sweetener to whatever you have planned and score you extra brownie well sweet vanilla cookie points with that someone special. 1. Preheat the oven to 190C/375F/Gas 5. Line a baking tray with parchment paper. 6. Using heart cookie cutters, cut biscuits out of the dough and place onto the baking tray. 7. Bake the cookies for 8-10 minutes, or until pale golden-brown. Set aside to harden for 5 minutes, then cool on a wire rack. 8. For the icing, sift the icing sugar into a large mixing bowl and stir in enough water to create a smooth mixture. 9. 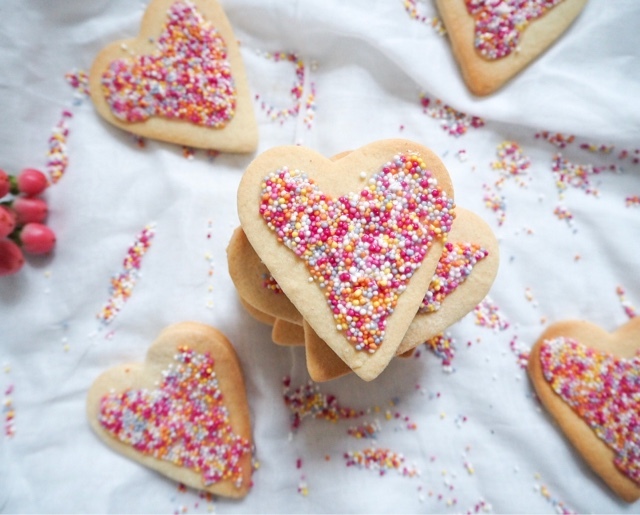 Spread the icing onto the cookies using a teaspoon, in a heart shape smaller than the cookies, sprinkle your 100 & 1000s over the icing set aside until the icing and sprinkles harden. I am actually really starting to enjoy this baking adventure, even better when I've Leanora to help me, great activity for the whole family or very relaxing and therapeutic on your own. These are absolutely adorable!! Too cute to eat haha! !